Celebrating our 130th year! 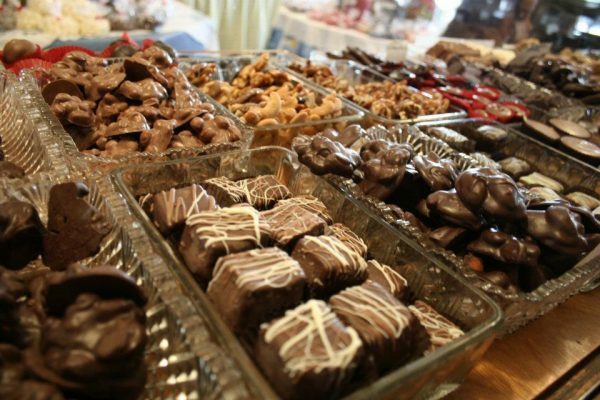 Boothbay Harbor’s oldest candy store specializes in fine chocolates, including Sea Salt Caramels, Marzipan, varied Truffles, a fin Licorice collection, 11 Fudges, including our new Sea Salt Penuche Caramel, Blueberry, Chocolate, Rocky Road and Chcolate/Peanut Butter…Treats for kids of all ages! Summer on the coast of Maine has always been a special time. Visits to the seashore. Clambakes and picnics on the rocks. Eating ice cream and candy. It was on July 4, 1885 that Addie Orne first opened the doors of Orne’s Candy Store in downtown Boothbay Harbor on the coast of Maine. The store had been purchased by her husband, Thaddeus W. Orne, a successful insurance salesman with New York Life. On that first day her shop was supplied with ice cream, bananas and a variety of candies. Over the next 75 years, the woman who became known as Aunt Addie expanded her stock to include many fine quality chocolates and other traditional candies. In 1960 Wolcott Webster purchased the store, with the promise that he would preserve the atmosphere of an old-fashioned 19th century candy shop. While doing so, he also made improvements. First he worked with a candy maker Custom House Square in Boothbay Harbor to perfect a recipe for Maine, make fudge that he liked, and that, he knew, would lure people back again and again. And he succeeded. Orne’s fudge – smooth and creamy – has been the shop’s most popular item for more than 40 years. Then, he added to the shop’s selection of chocolates displayed in the fancy dishes in the antique glass and wooden cases. In 1978, John and Jean Webster assumed operation of the store. Today, there are four family members at the helm: John and Jean, as well as Arthur Webster and Faith Foster. The store still looks very much the way it did in 1885. Many people who bought penny candy from Aunt Addie or her clerk, Susie Clark, bring their grandchildren back to see one of their favorite places in Boothbay Harbor.